Hamari Adhuri Kahani is an upcoming romantic drama, which has been directed by Mohit Suri. Famed for his notable works Aashiqui 2 (2013) and Ek Villain (2014), Suri returns yet again, but this time with a fresh star cast. 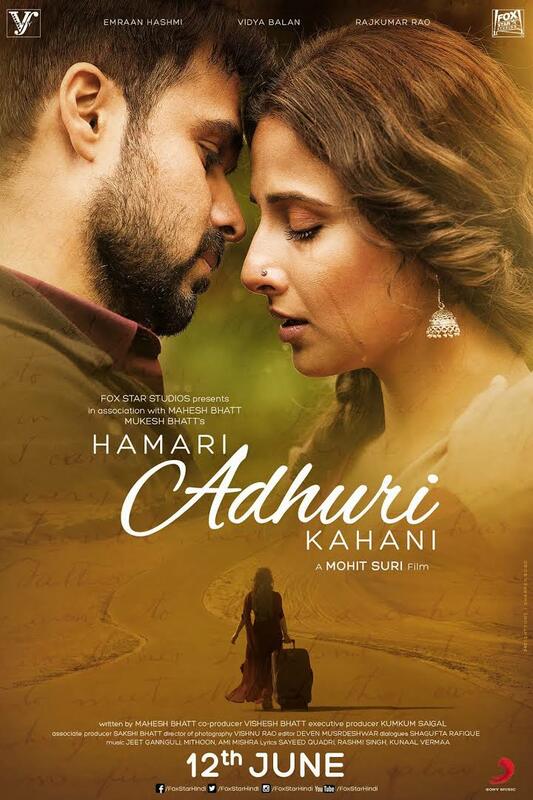 Starring Emraan Hashmi, Vidya Balan and Rajkumar Rao in pivotal roles, Hamari Adhuri Kahani is reportedly based on the love story of film producer Mahesh Bhatt’s parents. Scheduled for release on 12 June, the film has a high level of expectations from the mass audiences, who have made Suri’s previous two films blockbuster hits. The music to the film has been composed by Mithoon, Jeet Ganguly and Ami Mishra. Does the music to Hamari Adhuri Kahani have anything that’s worth listening to? Is it as good as Aashiqui 2 or Ek Villain? Read on to see what we thought of it! To start off we have the title track ‘Hamari Adhuri Kahani,’ performed by the one and only Arijit Singh. The song has a nice eclectic mix of instruments such as the piano, violin and the flute; all of which gives it a hauntingly beautiful composition. Although the song itself is quite long, nevertheless, it is still a praiseworthy attempt on Jeet Ganguly’s part; who has put a lot of heart and soul in to making of this. In addition, Arijit performs well throughout the song and doesn’t fall flat anywhere. Though its impact is not at the same level as the super hit romantic number ‘Tum Hi Ho,’ Arijit has still done a respectable job and gives the song the body which it needs. There is also a second version sung by Jeet Ganguly, which is good in its own right; but probably not as memorable as Arijit’s version. This is definitely one of the big highlights of the album and therefore worth checking out. Next is ‘Humnava,’ which has been composed by Mithoon and sung by Papon. This is probably one of my favourite songs in the album, which has been composed with a great deal of thought. I love the style of music which Mithoon adopts for his compositions, which gives it more originality. I also enjoyed listening to Papon’s vocals, who is not your typical commercial Bollywood playback singer; yet manages to do justice to the song. Another great tune which certainly deserves your time. Finally we have ‘Yeh Kaisi Jagah,’ sung by Deepali Sathe. I enjoyed listening to Deepali’s voice and she is a breath of fresh air who does justice to the song. Although this one is not in the same league as some of the other songs in the album, it is still a decent composition with nice use of instruments like the guitar and the flute. Hence, try it out and see for yourselves. You may end up liking it. 16 queries in 0.622 seconds.